Is Transformative: More than just redefined, learning is purposeful and involves wider implications. Is More Doable: Makes things like critical thinking and collaboration more possible. Enables Student Voice: Technology provides a voice for students to take ownership over their work and ideas. Involves Modelling Digital Citizenship: More than a sole lesson, eLearning should be about foster competencies throughout the curriculum. I supported this with a list of readings to clarify where my thoughts had come from. Although as I have stated time and time again, it takes a village and recognising everyone in the village can be a futile act. ‘Do We Really Need New Things in New Ways?’ by Bill Ferriter. This post discusses problem with ‘redefining’ learning and instead argues that it makes such activities as communication and collaboration more ‘doable’. ‘Clearing the Confusion between Technology Rich and Innovative Poor: Six Questions’ by Alan November. Moving beyond redefining learning, November outlines six questions that we need to ask in order to transform and innovate learning practices. Anthony Speranza provides a useful take on this with a helpful video summing it all up. ‘Why Small Pedagogical Changes are More Likely to Positively Impact Student Learning’ by Richard Olsen. I have discussed Olsen’s whole IOI Process elsewhere, but this post in particular highlights the importance of small steps in order to make sustained change. ‘The Problem Finders’ by Ewan McIntosh. Often we talk about getting off the stage as teachers, for some this means becoming learners, while for others it is about being a meddler-in-the-middle. Whatever it maybe, McIntosh captures in this TED Talk what I feel is the most important change, that is supporting students in finding their own problems. ‘Without Student Voice, Technology Just Fosters Another Type of Compliance’ by Peter DeWitt. Although this is something that many of spoken about and Steve Brophy and I also presented on, however I think that DeWitt represents the problem most clearly in this post. ‘Digital Citizenship Education in Saskatchewan Schools’ by Alec Couros and Katia Hilderbrandt. Too often students are delivered lessons on digital citizenship as if it were some vaccine needing to be delivered on a regular interval, Couros and Hilderbrandt provide a different take on this. They provide a framework for a more holistic approach to digital citizenship in school. ‘Why Even the Worst Bloggers are Making Us Smarter’ by Clive Thompson. A chapter from his book Smarter Than You Think, Thompson provides a fantastic argument for the power of blogging, but more importantly publishing for a wider audience. ‘Infusing SAMR into Teaching and Learning’ by me. There are so many different takes and interpretations on SAMR and although it maybe useful as a point of conversation, it is important that we realise that like an solution, there are no silver bullets. ‘The Essential Elements of Digital Literacies’ by me. A review of sorts of Doug Belshaw’s fantastic book, what needs to be understood is that there is no one digital literacy, instead it is something that we do and that it is something constantly changing with the ebbs and flows of the river. My concern with this whole process though is two-fold. Firstly, a vision is not created by one person, however compelling that may be. 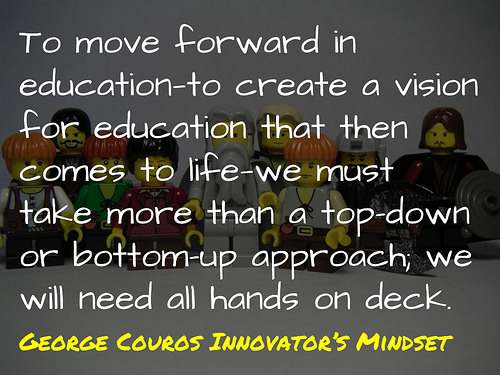 A point that George Couros makes in his book Innovator’s Mindset. This is a problem I had with the DET EDUSTAR training where a few random representatives were expect to be the voice of a whole school. While secondly, an eLearning vision needs to marry with the school’s wider vision for ‘learning’. The question then remains as to how we make a vision for learning and technology which supports the whole school with a common goal? So what about you, what is your eLearning vision? How is it integrated within the wider school vision? As always comments are welcome. Vision for eLearning by Aaron Davis is licensed under a Creative Commons Attribution-ShareAlike 4.0 International License. Earlier today, @mesterman prompted me to read another blog post by the continually inspiring @mrkrndvs: Vision for eLearning. A confident and provocative post, there is a lot to take from Aaron’s work. However, there was a point I felt I had to make to Aaron on Twitter and the resulting discussion involving @rgesthuizen, @ozjuliancox, @rhonimcfarlane prompted this blog post. “Personal experience in the field of involving students as an active element in the technology integration process indicates to me that their involvement could greatly influence its success. In a variety of capacities, students can take an active role in how technology is used in classrooms, how and what their peers should learn, sharing their existing knowledge and the best approaches in using technology to meeting the needs of learning exercises and students (Mullen, 2015). The role does not need to be confined to classroom practice, however. It can be seen in physical design of learning spaces (Classrooms of the Future, 2003) and in decision-making around the enhancement of technology enabled learning, advising on policy and curriculum matters (State Government Victoria Dept of Education and Training, 2014). In Aaron’s blog post, he cited work by @PeterMDeWitt: Without Student Voice, Technology Just Fosters Another Type of Compliance and, to my mind, much of what he talks about in this post concurs with my views. Terms such as ‘fostering’, ‘amplifying’ and ‘working collaboratively with students’ are the essential ingredients to student voice being action. They are the foundations for active involvement of students in technology enhanced education. Thank you Aaron. This reading list is excellent, and is familiar to me. Defining and describing learning environments and learning experiences is a challenge because interpretations are so varied. This is why the blog posts, comments, and conversations are essential; to develop some common language, coherence, and as you mention, vision. It’s difficult, if not impossible, to arrive at consensus without these conversations. Have all stakeholders perspectives been invited and considered? Have school goals been clearly communicated? Are opportunities provided for self-evaluation and reflection? My appreciation and understanding of learning is growing through web interactions. My eLearning vision has the e “embedded” in my everyday learning activities.